We are a proud Indigenous Tourism Champion and a not-for-profit art & craft corporation 100% owned and controlled by Anangu (Aboriginal people from the Central and Western deserts) for over 30 years. Approximately 900 artists make up the collective that is Maruku. We exist to benefit the artists, their families, their communities and play a key role in keeping the traditional cultural practices strong and alive throughout the Anangu lands. Maruku is a regional art centre and, therefore, a representative of Anangu culture and art. Our commitment to excellence is driven by the fact that we are a direct link between Anangu culture and tourism to the area, a role we take seriously. We want to educate our visitors about Anangu culture and history; in turn cultivating respect and understanding for this ancient culture and its differences to our own. 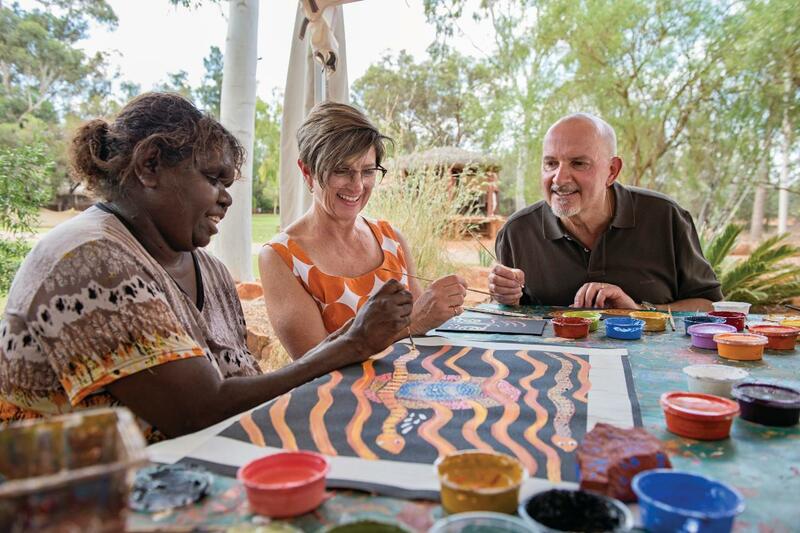 Sharing stories and passing on traditional methods of painting plays an important part in the sustainability of Aboriginal culture, the world oldest living culture. We invite you to join Maruku’s local Anangu artists for a fun introduction to the unique desert art form - Dot Painting in a 1.5 hour format. Learn about the symbols and painting styles used to create beautiful works of art depicting the Creation time (Tjukurpa) stories. Bringing a touch of something unexpected, colourful and a connection to the experience while celebrating and combining stories of people and places. Be inspired and join the artists to complete your own story in painting which you will take home as a memento of your experience. An absorbing and fulfilling time for all ages and gender. Please note children (0-15 years) need to be accompanied by at least one paying adult.